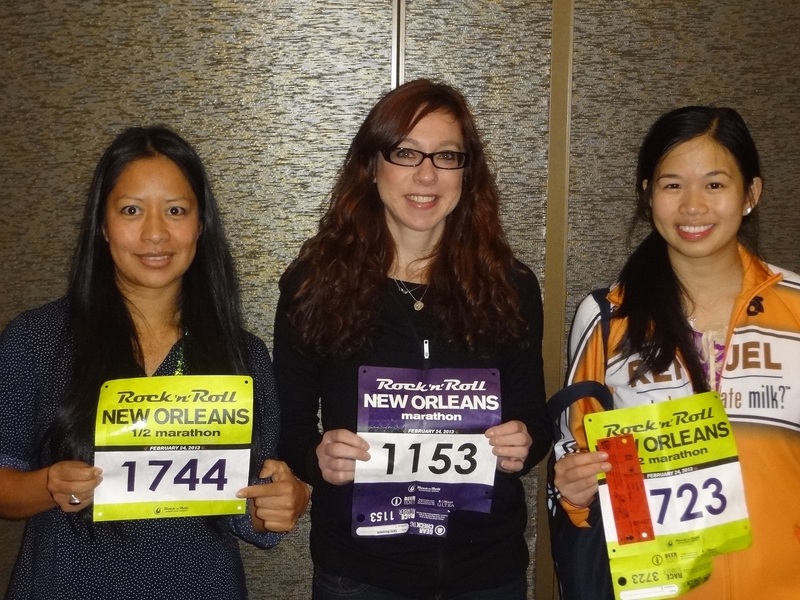 I was super excited to represent Team Refuel at the Rock ‘n’ Roll New Orleans Half Marathon on 2/24/13! Any excuse to fly down to New Orleans is a good one! 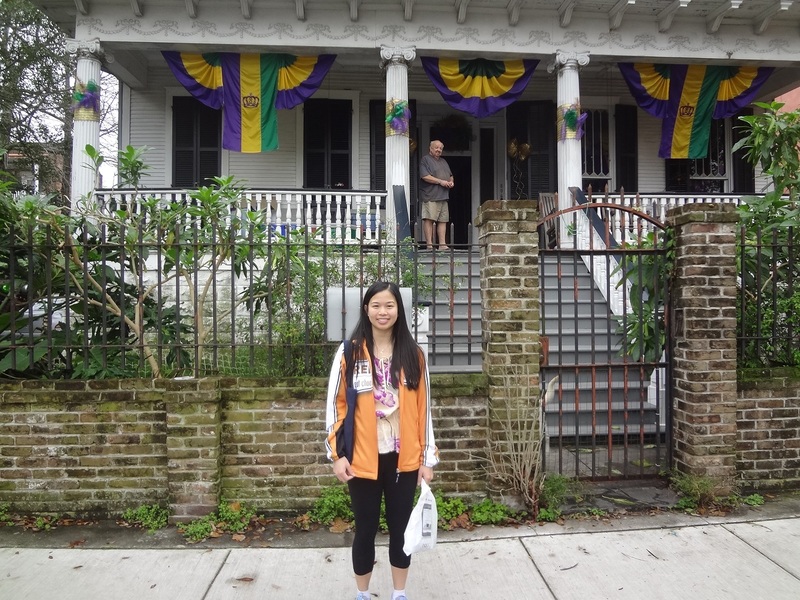 I knew that I was going to indulge in some good ol’ Cajun food and fried chicken, but I wanted to do well in the half marathon to test my fitness. It was definitely a balancing act. I arrived late Friday night so I could pick up my packet at the expo on Saturday. But first things first, my friend Steven and I headed to Willie Mae’s Scotch House for the best fried chicken in America (according to the Travel Channel and Food Network). There were a bunch of people waiting for their fried chicken at 11am when we got there. Unfortunately, we couldn’t eat in the dining room because there were plumbing problems, and all orders were packed to go. No big deal–we enjoyed our lunch in the car! 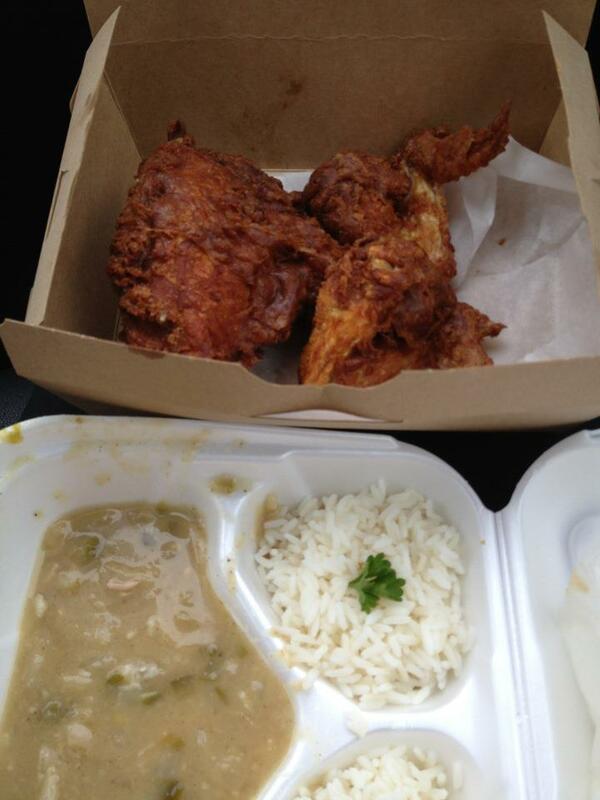 I ordered the white meat chicken with buttered beans and rice. It was a steal at $13. 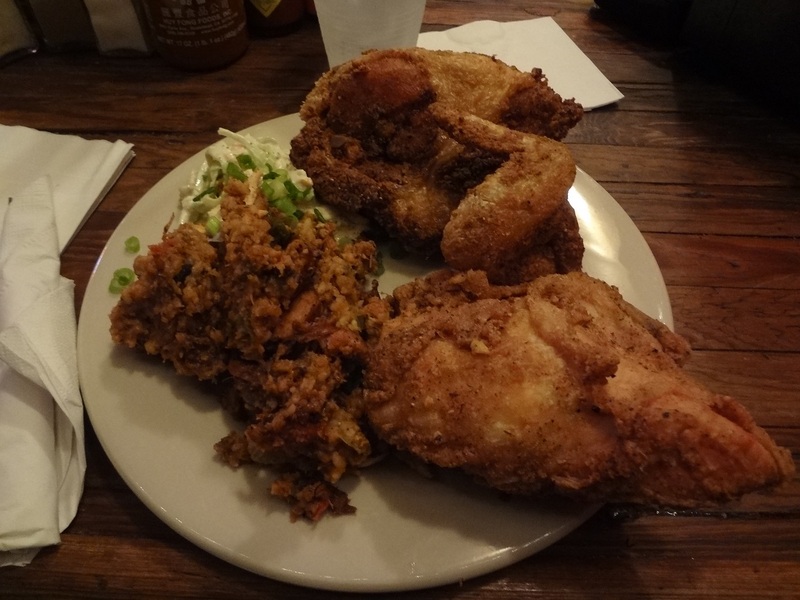 My pre-race meal: fried chicken at WIllie Mae’s the day before . SO good. Top three fried chicken ever. The verdict? Definitely worth the trip to Treme and it was the top 3 best fried chicken I’ve ever had. The only other fried chicken comparable to it was at Coop’s Place (NOLA) and The Redhead (NYC). I’ll have to come back next time! Off we went to the expo. I picked up my packet and met up with fellow Team Refuel members Jesus and Jeremy who also happened to be at the Got Chocolate Milk? booth at the same time. Picture time! Me and Jesus S. Go Team Refuel! I love the Cavalcade of Curiosities display by Brooks! 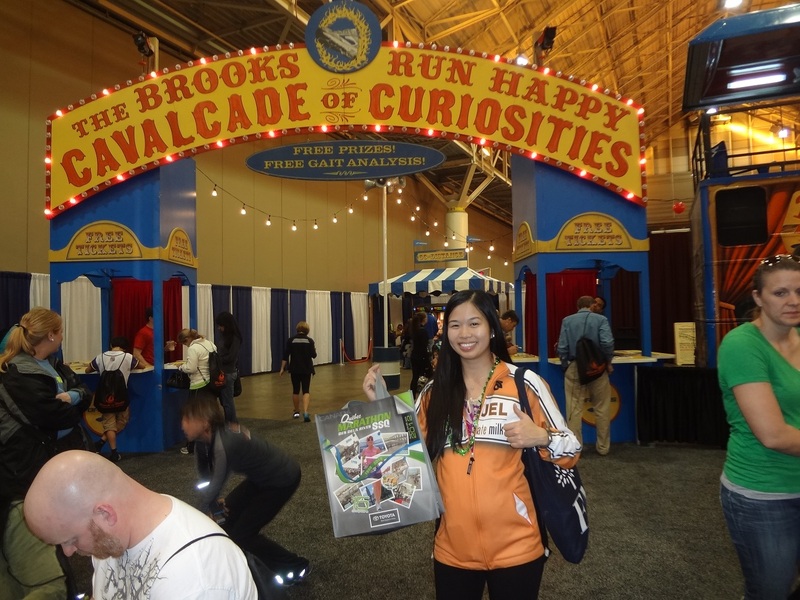 The expo was a bit of a madhouse–I got a free t-shirt as a door prize from Brooks’ “Cavalcade of Curiosities,” some Powerbar Fruit packet samples, but not much else. I missed meeting Kara Goucher, but I did get to see my NYC friends (and fellow Kara fans) Benny, Carol and Keila at the expo. Good luck everyone! Before I headed to my pre-race meal at Domenica, I sat down to hear a chat between running greats Frank Shorter (gold medalist in the Munich Olympic marathon) and Rod Dixon (past NYC Marathon champion). I got photos with them afterwards! 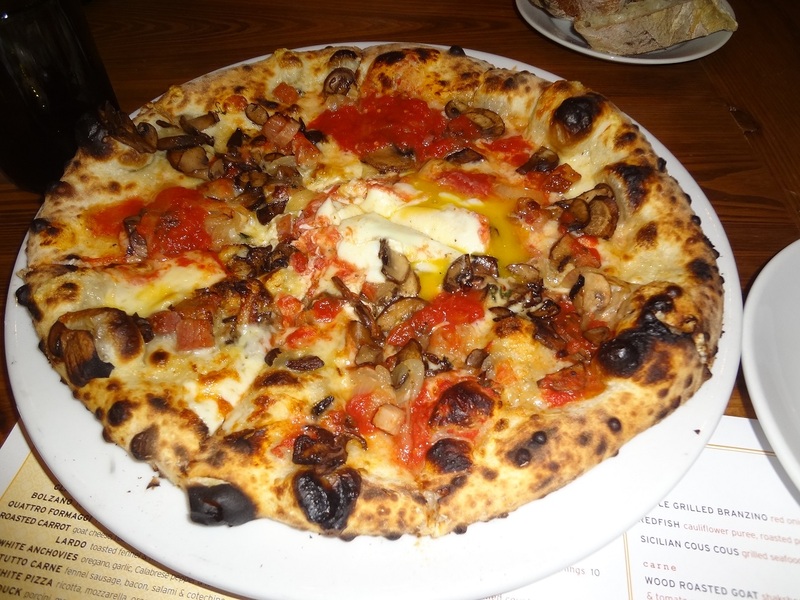 At around 4:30pm, I headed to my early dinner reservation at Domenica. I ate super early for two reasons: 1) it was the only reservation I could get last minute due to the gobs of people in town, 2) Happy hour lasts until 6pm and pizzas and beer are 50% off! Good to know. 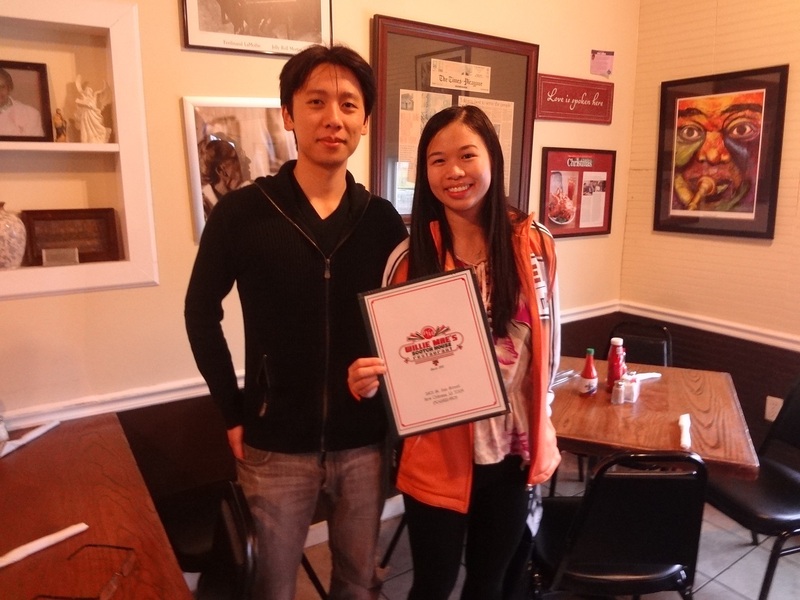 I came here last year and was very impressed by the food and modern ambience, so I wanted to come back. 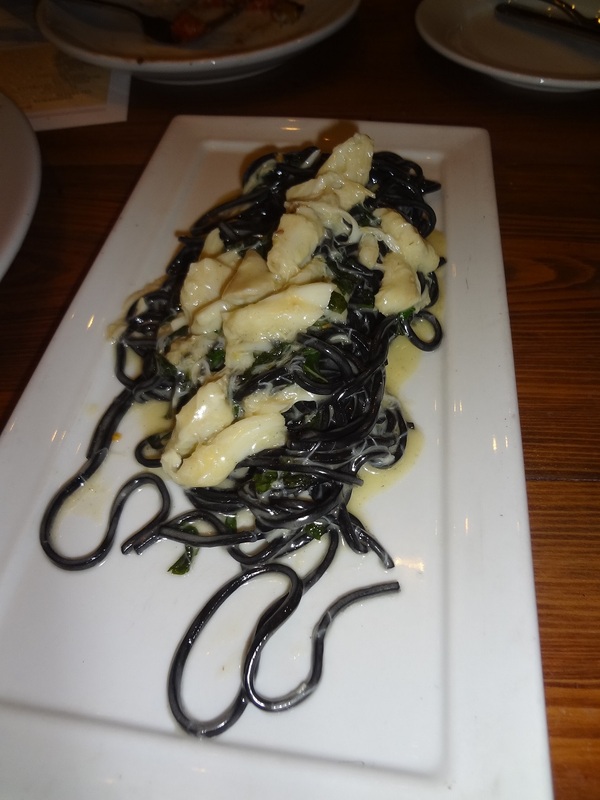 This time, my friend and I ordered the wild mushroom and bacon pizza with farm egg (yum) and the squid ink tagliolini with blue crab meat and lemon sauce. The tagliolini was buttery and oily but sooo good! Admittedly, I didn’t do too much research this time around about food. Next time, I would love to try a new place like Jacques-imo’s, the Upperline restaurant, and/or Cochon. There’s just too many good places to eat. There’s also super pricey options like Galatoire’s brunch, Antoine’s and Commander’s Palace…maybe in a few more years haha. I’m just happy eating good food without breaking the bank! I woke up super early and excited to run! 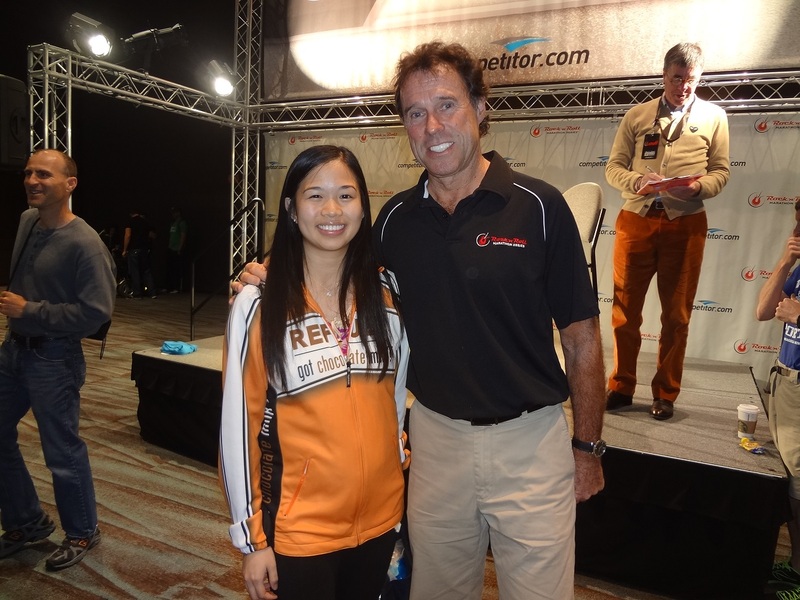 I was representing Team Refuel and I wanted to get there early to meet my friends. I also had access to the VIP tent so I wanted to take advantage of that too. Steven was a good sport and dropped me off at the start line, bright and early at 6:00am (race started at 7:00). I chatted with some Team Refuel members, including Jeremy and George, and relaxed in the VIP area where they had muffins, bananas, and private bathrooms for us. These things make a difference when you’re in a rush! 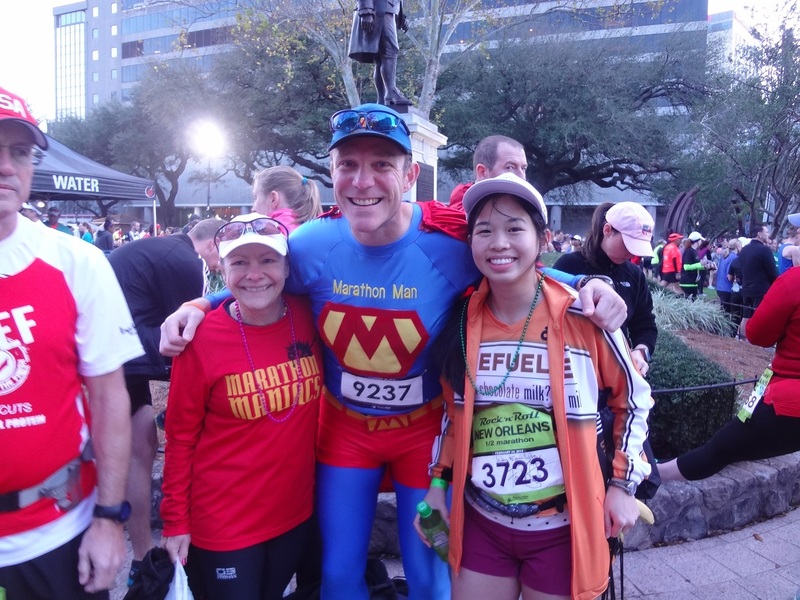 I also met up with my Aussie friends Jane and Trent, who I haven’t seen since the 2012 Tokyo Marathon! There were a lot of notable elite athletes running the half. I didn’t realize it at the time I signed up for the half-marathon; normally I opt for the longer distance, but I ran the full marathon last year and got Louisiana as a state in my 50 states quest. I wanted to be able to sightsee and enjoy the food without worrying about 26.2 miles this time. Mo Farah, Meseret Defar, Shalane Flanagan and Kara Goucher were some of the boldface names running in the half marathon. I didn’t see them in the VIP tent at the start, but I told myself that I’d run fast enough to at least catch them post-finish in the VIP tent! Good motivation! 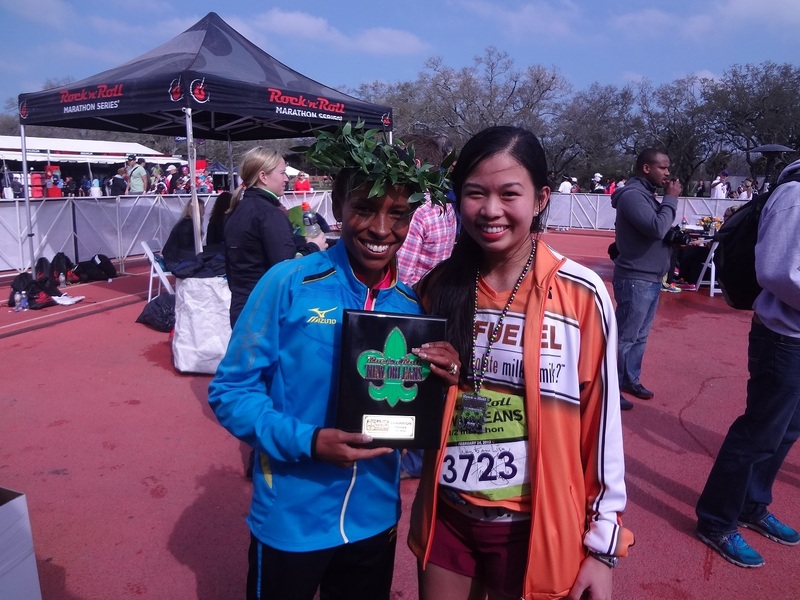 Usually elite runners are more than happy to greet fans post-competition, especially if they had a good day. 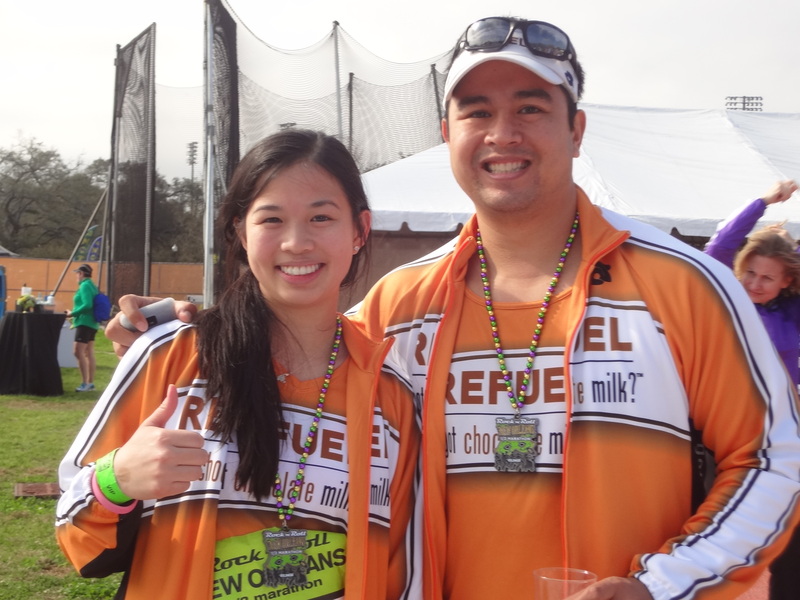 The course was flat and fast, and ran through the most interesting parts of New Orleans. I ran a PR here one year and wanted to do myself proud again. Secretly I was aiming for a 1:55, but it was still early in the season and I wasn’t in peak shape yet. During the race, I didn’t feel 100% myself. Then, I remembered that I had oily tagliolini and fried chicken for fuel. That was probably it. I could have regretted it but I didn’t–just gritted my teeth and pressed on. The weather was perfect–nice and cool but not windy. I remembered wishing I had my sunglasses on as we ran down St. Charles Ave. The out-and-back course allowed us to spot the elite athletes, so that was cool to watch. Mo was running like a champ, and Shalane and Meseret were neck-and-neck in the women’s race. I was actually on pace to run a PR for the first 7-8 miles of the race, then I bonked and ran out of gas. 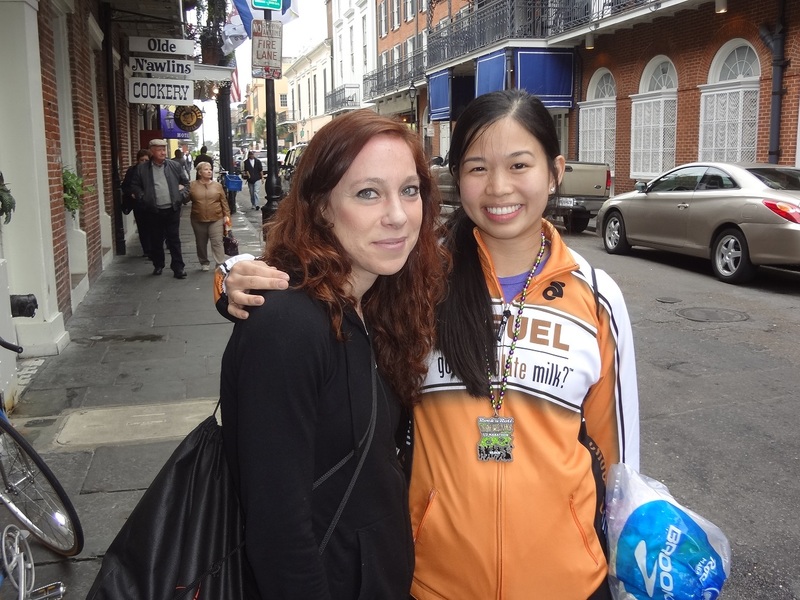 As we ran through the French Quarter in the final miles, I told myself to hold on. I still wanted to finish under 2:00, fried chicken in my stomach or not. We enter City Park and I know I’m almost done. My legs were fatigued but I urged them on. As I crossed the finish line, the announcer gave me a Team Refuel shout out! I vaguely remember him saying “Look at her sprint it in! Must be the chocolate milk!” As a rule, I always try to sprint it in to the finish. It doesn’t mean that I didn’t run hard enough. It just means that I want to finish strong. I was pretty pleased with my placing, especially because I placed in the top 13% of women. Sweet! It turns out that I was the first Team Refuel member to finish the half marathon as well. A Team Refuel rep, Lindsey, greeted me at the finish with encouragement and ice cold chocolate milk. It was nice to see a smiling face at the end! I met up with Jeremy (also on Team Refuel) at the VIP tent, and we chatted away while waiting for our respective friends. There was hot food like pasta, muffalettas, and po’ boys in the tent. There were beignets and yogurt cups too! As if that weren’t enough, you could get a mimosa and we had our own private supply of chocolate milk. So awesome! Best of all, the elite athletes were chilling in the same space while they waited for the awards ceremony. I was really excited about meeting them, but I especially wanted to meet Mo. He became a household name since he won gold in the 5,000m and 10,000m in the London Olympics. He also won the half-marathon in a sick time of 1:00:59! 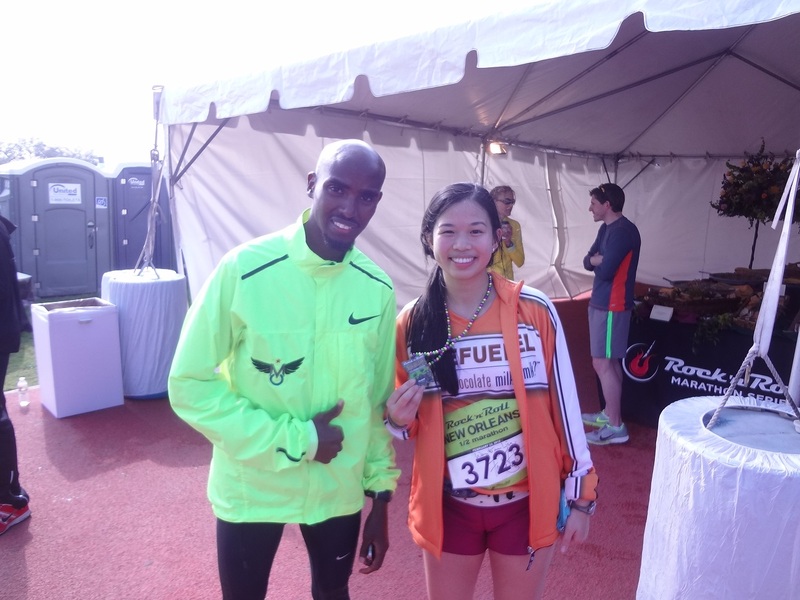 Me and Mo Farah–he won in 1:00:59! 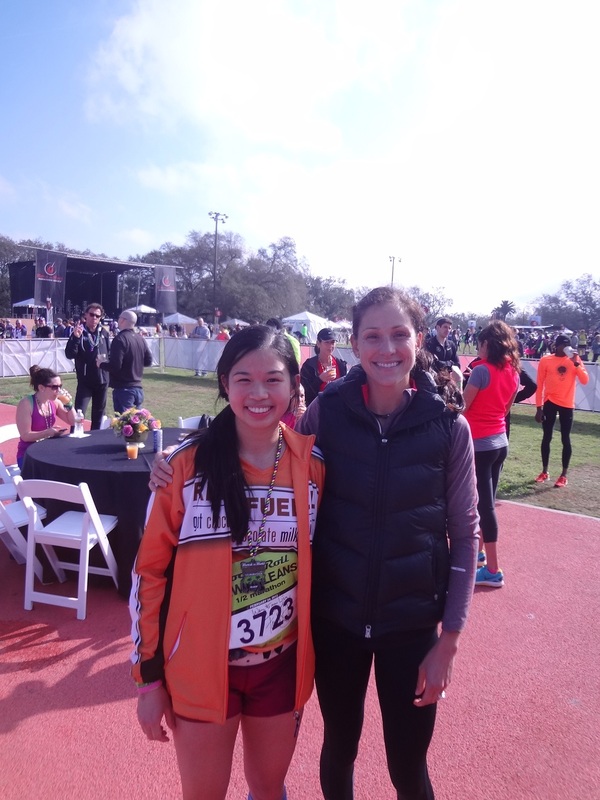 Kara Goucher was so funny and sweet. Even though I’ve met her multiple times, I always make an effort to say hello if she’s doing an appearance. She asked her agent if she had spinach in her teeth before taking a photo with me, haha. Me and my teammate Jeremy. Soon he’ll be starring in a Got Chocolate Milk? ad! It was a great day. 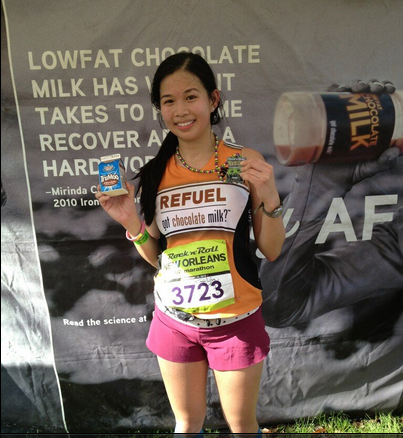 It’s my third time running this race in New Orleans and I feel blessed that Team Refuel sponsored my race entry this year. 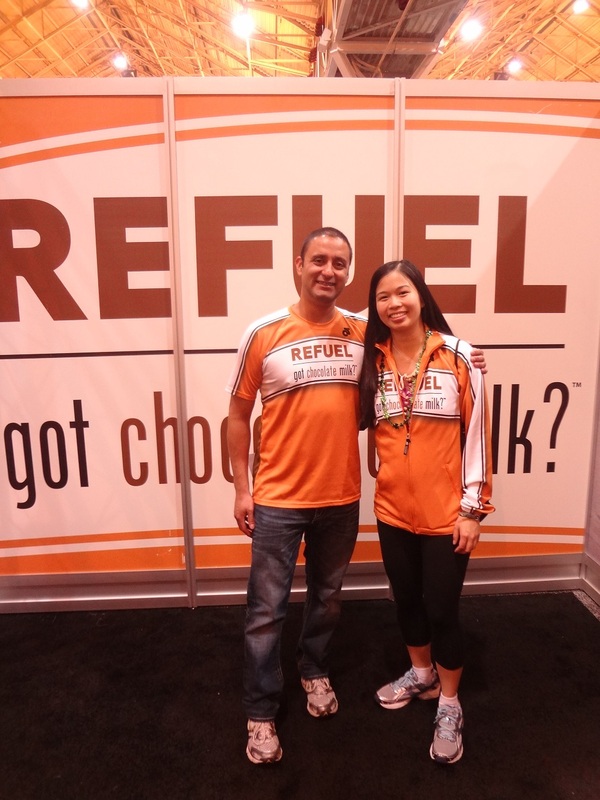 Thanks Team Refuel! I really enjoyed meeting teammates from different geographical areas. Everyone is really nice. Finally, you’d think I was able to rest and take a nap after all that running, but I went sightseeing and eating instead. I met up with friends at Oceana for some gumbo. I had previously had an illy coffee and a strawberry and Nutella crepe at Merchants cafe, so that was my brunch. 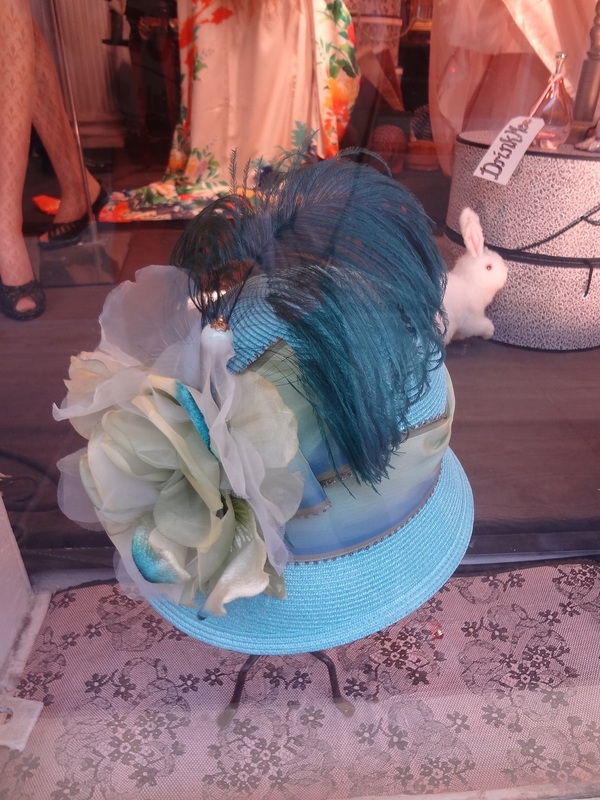 We also walked around in the French Quarter, where I did some souvenir shopping and explored the French Market a bit more. For dinner, Steven and I met up again and we headed to Coop’s Place for some more delicious fried chicken. They use an awesome spice/pepper blend for their chicken and I can’t resist going here for the third time! The chicken comes with jambalaya too. I wish I could eat like this more often. 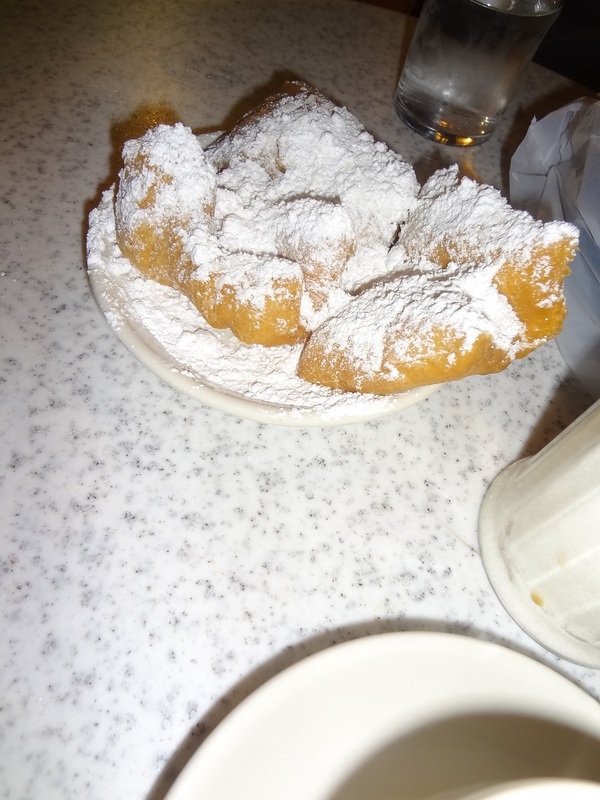 It started raining, and after dinner we headed to Cafe du Monde for their famous beignets and chicory coffee. We tried going yesterday at 11am but the line was ridiculous. At 8pm on a Sunday, we sat down right away. I missed out on going to Cafe du Monde last year so I made up for lost time! 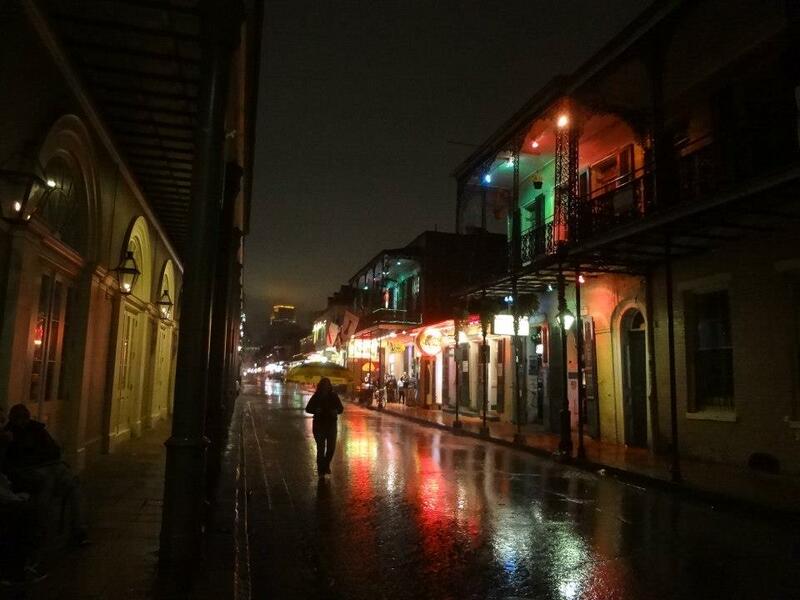 Finally, as I walked down Bourbon Street (not a huge fan of the touristy scene), I noticed how quiet and beautiful the street was in the rain. This is probably one of my favorite photos I’ve taken in recent memory. Soon, I would fly out at 7am and return back to my beloved NYC. Until next time! 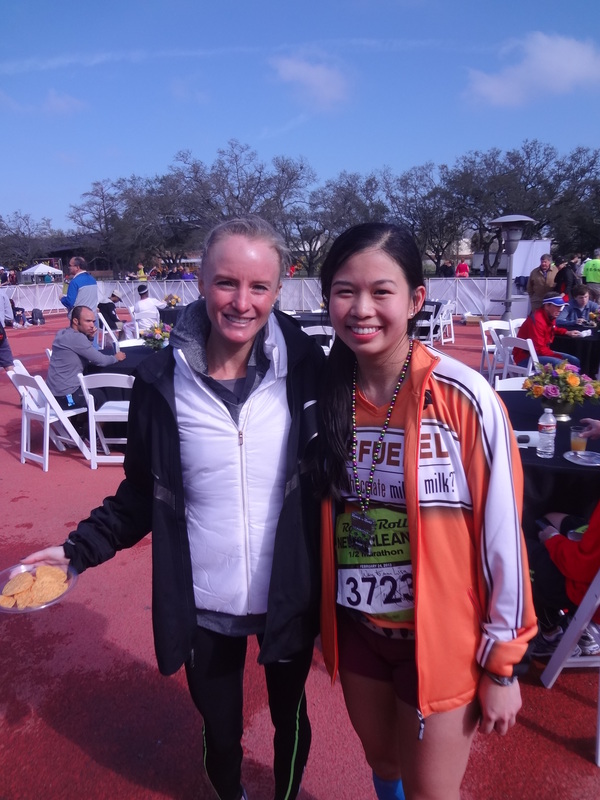 Categories: Foodie, Half Marathons | Tags: chocolate milk, Coop's Place, Domenica, fried chicken, got chocolate milk, half marathon, Kara Goucher, Louisiana, Mo Farah, myAfter, New Orleans, Rock 'n' Roll New Orleans, Shalane Flanagan, Team Refuel, Willie Mae's | Permalink.